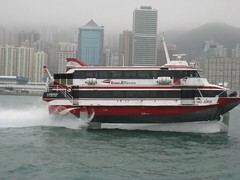 High speed Macau ferries take folks to Macau for Gambling. I think the trip is about 30 minutes from the peer in Hong Kong's Victoria Harbor to the island of Macau where massive gaming development is underway by Chinese and Las Vegas casino interests like Wynn, Venetian, and MGM. But Macau is a lot more than gambling. The island offers a look back into the fascinating history of the Portuguese colony in the heart of the orient. Cher started in Las Vegas and she's still going strong with what is likely to be one of the most spectacular shows in Las Vegas History, starting at Caesar's Palace May 6th. Cher's career spans several decades during which she has soared to mega stardom after being something of a second fiddle to comidian and pretty bad singer Sonny Bono with whom she shared the "Sonny and Cher" TV show, a marriage, and daughter Chastity Bono. Cher's amazing talents include brilliant movie performances and dozens of huge pop music hits.